In two words: pure chaos. It’s hilarious. Normally, no combat occurs at the start of Fallout 4. 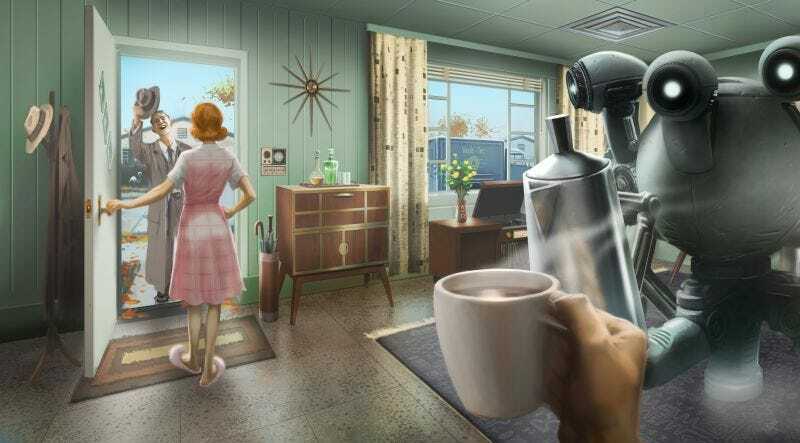 It’s a pretty linear experience: you spawn, you make your character, you meet your son, and then you dash into the vault before the bombs fall. If you dilly-dally at all, it’s game over, and everything explodes. My favorite part about this is that none of the residents of Sanctuary are passive about it—they fight back! Some of them even pick up the Synth’s weapons. But mostly, it’s the smaller details at play here. Notice how, for example, Shaun seems to be grafted onto his mom’s arm. Or how, for whatever reason, some of the residents are carrying around ammo for handguns. So good.